Pangbourne Circular (via Goring-on-Thames) - (10 miles) 16km. You must be a member of the London Hiking for Fun & Fitness Group to attend this activity. Would you like to join this group? via wooded ridges with splendid views. 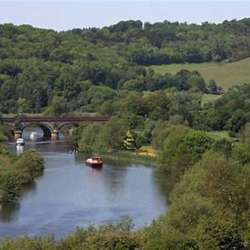 From Pangbourne we cross the river on the delightful Whitchurch toll bridge into Oxfordshire and ascend through Whitchurch-on-Thames and then some pastures to the highest point of the walk, with first scenic views down some pretty combes. The route follows the partwooded ridge above the Thames Valley, with occasional splendid views of the valley and the Goring Gap between the Chilterns and the Berkshire Downs, before descending through a wildflower nature reserve and then leading along the valley bottom to Goring-on-Thames where we have lunch. After lunch we return along the Thames Path Long Distance Trail, mainly through the river meadows, occasionally framed by wooded hills, then up through Hartslock Wood, and back down through Whitchurch. THIS IS THE FIRST TIME I AM DOING THIS WALK. IT IS AN EASY ROUTE BUT THERE MIGHT BE SOME NAVIGATION ERRORS. There are trains from Paddington. You will need to change in Reading. 2. Please organise amongst yourselves if you would like a group saver. You can post messages on the activity page. 3. Please note that hiking as an outdoor activity carries a risk of injury. When you RSVP, you confirm that you are in good health and accept this risk. 4. Please wear walking boots or shoes. Preferably water proof. The paths can be muddy and slippery. This depends on the weather we have before the hike. Also bring rain proof jacket in case it rains. 5. Bring a packed lunch and plenty of water. We might visit a pub for lunch but we will definitely go to a pub after the hike so bring some money with you. 6. Please note that on hikes, toilets are not always available, so when we need to, we might have to go in the bushes. 7. Please, please, please cancel your attendance if you change your mind, so there is room for others who wish to join. 8. Feel free to phone or text me if you have any questions. 9. WEATHER: Please note that it might be necessary to cancel the hike if the weather is really bad. The hike should go ahead if there is little rain. Please be kind enough to cancel your attendance if you cannot make it and note that repeated non attendance might be reported to Internations management and might result in your removal from any future guest list.